The new iPad sports a 9.7-inch retina display with an astounding 264 pixels per inch. With a 2048-by-1536-pixel resolution, the screen now contains four times as many pixels as the iPad 2. Apple also claims 44% greater color saturation. Now, that’s a lot of numbers. What do they mean? Let me put it this way: the new iPad contains over one million more pixels than an HDTV with 1080P resolution. The results are vivid photos, clear text, and full-resolution playback of high-definition videos. To power the new retina display, Apple introduced a new chip - the A5X. The chip contains quad-core graphics, offering twice the performance of the iPad 2’s A5 chip and four times the performance of the NVIDIA Tegra 3. Apple didn’t explicitly state CPU specifics, but AnandTech believes it sports the same dual-core Cortex A9 processor that is in the iPad 2. The new iPad keeps the same crappy VGA FaceTime camera on the front of the device, while the rear gains a new 5-megapixel iSight camera. The iSight camera supports autofocus, tap-to-focus, and face detection. The camera can also record 1080P high-definition videos, has built-in image stabilization, and temporally reduces noise. The new iSight camera represents a big improvement over the iPad 2’s rear camera. Voice features are now available on the new iPad in the form of voice dictation. Missing from voice services, however, is Siri. My guess is that Apple decided to keep the assistant off of the new iPad because it is still in beta and isn’t quite ready for millions of new devices to hammer its servers. The processor is more than capable, so I would expect Siri to come in the near future. Wireless connectivity includes Wi-Fi (802.11a/b/g/n) and Bluetooth 4.0, also known as Smart Bluetooth. The Bluetooth upgrade is substantial, supporting low-power devices and, as developer Ross Kimes points out, cool new hardware interactions. The new iPad now (optionally) supports the latest cellular connectivity in 4G LTE. In the United States, only two carriers are supported at launch - AT&T and Verizon. The AT&T model will support GSM/EDGE, UMTS/HSPA/HSPA+/DC-HSDPA, and LTE. The Verizon model will support GSM/EDGE, UMTS/HSPA/HSPA+/DC-HSDPA, CDMA EV-DO, and LTE. If that sounds like a lot of bands, it is. In fact, the new iPad has the most cellular bands ever shipped in a product. The important takeaway is that LTE is fast - up to around 72-Mbps down. On AT&T, the iPad will drop to HSPA+ when 4G is unavailable, while on Verizon it will drop to the slower CDMA EV-DO. You would think that given all of the above enhancements, the iPad’s battery life would suffer. 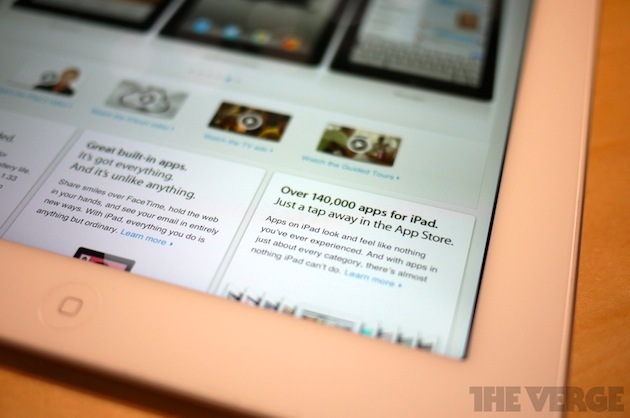 However, Apple claims that the new iPad will still achieve 10 hours of battery life (9 hours if on 4G). That is impressive. To house the additional space needed by the battery and cellular antennas, the new iPad is slightly thicker (by 0.2 inches) and heavier (by 0.07 pounds) than the iPad 2. The device now measures 9.5 inches by 7.31 inches by 0.37 inches and weighs 1.44 pounds for Wi-Fi and 1.46 pounds for Wi-Fi+4G. Apple once again left prices unchanged. The Wi-Fi model costs $499/$599/$699 for the 16/32/64GB models, while the Wi-Fi+4G model runs $629/$729/$829 for the same capacities. Users now have the option to add AppleCare+ to the iPad for $99. This protection plan covers defects and accidental damage for two years. Accidental damage coverage is valid for up to two incidents and requires a $49 service fee. AppleCare+ must be purchased within 30 days of buying the new iPad. Many will decry this update as a ho-hum evolution. However, consider that Apple was already dominating the tablet market with the iPad 2. Competitors could not match Apple’s price for equal specifications without resorting to smaller screens and carrier contracts. While these companies were busy trying to compete with the iPad 2, Apple just released a new version that contains a retina screen, quad-core graphics, an enhanced camera, the latest in cellular connectivity, and more. Most importantly, they added all of that with the same battery life and the same price points. If 2011 was the “Year of the iPad 2”, I don’t see why 2012 won’t be a repeat for the newest iteration.